I am always curious about how my favorite cities compare in geographic size. Take San Francisco and New York City, for instance: if I walk from The Embarcadero to Ocean Beach, is that about the same distance as strolling the length of Manhattan? Looking at two maps side by side doesn’t always give a helpful overview, so I made this overlay animation for kicks. There must be a book of maps on transparencies that achieves the same effect in print. Give it to me. The two source images are from Google Earth, each at an altitude of 20 miles. On the NY map, the compass was rotated a bit to make Manhattan vertical. Most of the SF Bay itself is wider than most of Manhattan island. NY’s bridges are miniscule compared to those of the Bay. There is a lot of land to the east of Manhattan before you get to the Atlantic. 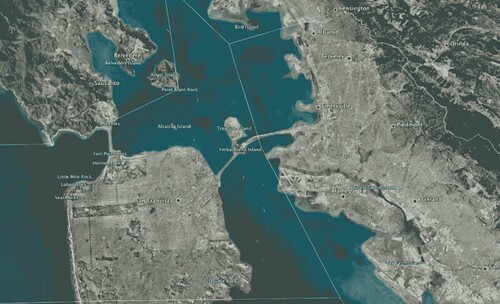 The Bay Area water is blue in Google’s satellite maps, while New York’s is a murky green. Have you ever seen Kottke's "Manhattan Elsewhere"? The color of images in satellite maps aren't always reliable for comparisons, as much depends on factors like the weather and time of day in which the particular photo was taken. I'm not saying that's surely why the colors differ, but just thought I'd point out that the possibility exists. It also could be because of water depth or actual cleanliness.